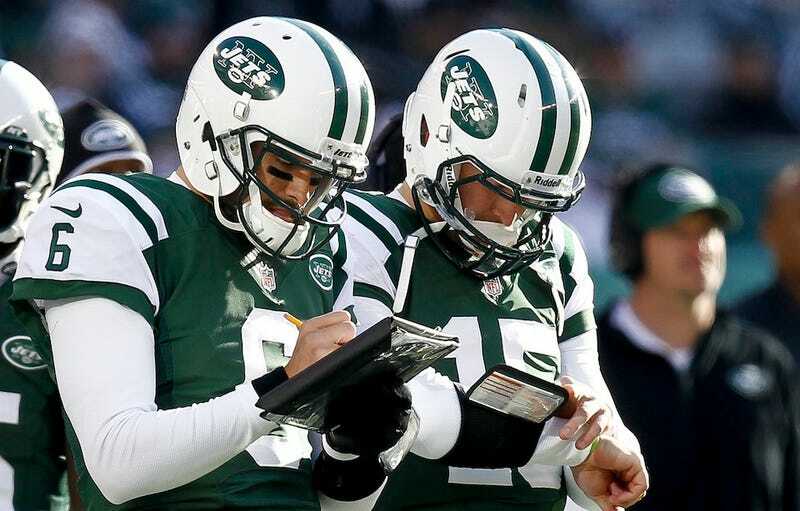 The Jets dressed three quarterbacks for their game against the Chargers yesterday—a game they lost, 27-17. Greg McElroy, the former Alabama quarterback who, evidently, never faced a pass rush while he was there, started, while Tim Tebow and Mark Sanchez backed him up. (Neither was the No. 3 quarterback proper, because No. 3 quarterbacks are not active on NFL gameday rosters.) This was the first game all year that the Jets had dressed three quarterbacks, even though they had plenty of reason to on prior occasions. Tebow has been frustrated all season by his lack of playing time, but it culminated Tuesday upon hearing he would be passed over for a starting opportunity when Ryan decided to bench Mark Sanchez. Tebow was disappointed and upset enough to say he didn't want to be used situationally, sources said. He told the Jets coaches early in the week, giving Kerley time to take the practice reps. Soon reports emerged speculating the backup was looking to play outside of New York next season. While Cam Newton was at Florida, Tebow wasn't the most talented quarterback on campus. After winning the Heisman Trophy, according to sources, he was outperformed by Newton in both practice and the ‘08 Spring game, yet Tebow (understandably) remained the starter. Newton was promised an opportunity to start in ‘08, but he never had a real chance given Urban Meyer's affection and preference for Tebow. At Senior Bowl practices in 2010, Tebow was so bad at taking snaps that shotgun elements from the Florida offense were added for him. That's right — his college offense was incorporated at the NFL's biggest job fair, one at which Tebow needed to show he could play a more conventional style of football. Who knew so many well worn sports-media tropes could collide in one player? Tim Tebow is the plucky winner who rides his leadership and intangibles to greatness. Tim Tebow is also the overrated prima donna, the one who grumps over limited playing time and sulks and eventually quits on his team before demanding a trade. All things to all men, this guy. Which one is the real Tim Tebow? Find out by tuning in to Jaguars games in fall 2013.